Owl Creek Veterinary Hospital’s experienced support staff of Client Care Specialists, Certified Veterinary Technicians, Animal Health Technicians, and Animal Care Assistants strive to provide personalized, compassionate care for our patients and clients alike. Our hospital leadership team is committed to assembling a dedicated staff and team of compassionate professionals committed to providing exceptional client service and veterinary health care. Marcie is one of our Customer Service Representatives. She was born in Austin, TX. 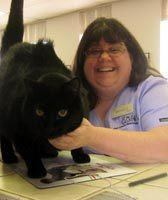 She has worked at Owl Creek Veterinary Hospital for 2 years. She enjoys working at Owl creek because she enjoys how everyone that she works with genuinely cares about the well-being of the animals they treat. She loves to game, watch movies, and play with her 4 children (animals). 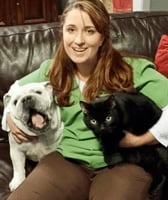 Marcie is the proud owner of an English bulldog named Petunia, 1 cat- Jett, 1 gerbil- Chewi, and 2 guinea pigs named Lucy and Dutch. 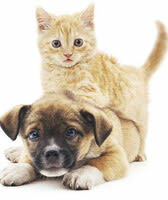 She enjoys the fact that Owl Creek has the best clients who treat their pets as members of their families. When asked what Owl Creek has to offer that other hospitals don’t have, she replied that “our doctors and staff always go above and beyond to help our clients and their pets. I love how they always are willing to see a sick pet, even if it means staying late”. The Client Care Specialist role is to provide consistently outstanding client services within our veterinary hospital environment. The Client Care Specialist functions as an integral team member within the hospital team to liaison between the client and doctor as well as to support the doctors and staff for both primary and emergency care services. A certified Registered Veterinary Technician directly handles inpatient and outpatient care, working hand-in-hand with veterinarians. They assist in exam rooms by taking patients’ history and vital signs; preparing vaccines; running diagnostic tests; and providing client education. Technicians directly impact doctors’ productivity, client service and patient care. A Veterinary Assistant’s role supports technicians and veterinarians in exams, treatment, surgery and boarding. The veterinary assistant also assist with housekeeping, client communication, in person and by phone for follow-up care and patient monitoring. The purpose of the Kennel Assistant is to provide husbandry care for the patients, assistance to all doctors and staff, and socialize dogs in day care.. The Kennel Assistant role is valued as an integral position within the overall hospital team. Groomers must have a combination of experience and knowledge to take proper care of their furry clients. Cleaning ears and nails, as well as trimming fur, ensures cleanliness and helps the groomer understand each dog’s general state of health. Brushing, bathing and drying dogs also falls under the umbrella of a dog groomer’s responsibilities, so having a strong knowledge of best grooming practices is critical for a proper groom.